The following is a guest post by Anne Felicitas, Editor at AdvertiseMint, a Snapchat advertising agency. Snapchat is like the popular trend-setting girl in high school every girl wants to become and every boy wants to date. Snapchat is unique and innovative, the first to set the trend for communication via images and videos, which competitors, particularly Facebook, quickly copied. Snapchat is so innovative and unique, in fact, that its main rival, Facebook, has been trying to defeat it since its inception. When Snapchat launched, it didn’t intend to monetize its app until Facebook attempted to render it obsolete. In 2013, Facebook’s CEO, Mark Zuckerberg, attempted to buy Snapchat for $3 million in cash. When Snapchat declined the offer, Facebook made several attempts to crush its competitor, first by launching apps similar to Snapchat and second by mimicking Stories. To compete with Facebook, Snapchat opened itself to advertising. When Snapchat advertising first launched, it was difficult for smaller businesses to advertise. Buying ad products from the company required talking to a salesperson, costing more time and money. Recently, however, Snapchat changed that by releasing Ad Manager, an ad management platform that allows smaller businesses to directly purchase ad products from the dashboard. Additionally, to compete with Facebook in social media advertising, Snapchat added three more ad products that push advertising through filters and lenses, ad formats unique to Snapchat. These ads are in addition to its already existing attachment ads, sponsored geofilters, and sponsored lenses. Below are brief explanations of each type of ads. Attachment Ads: Attachment Ads are 10-second video ads that appear between users’ Stories. With Attachment Ads, you can either attach a link to your website, an app install page, an article, or a long-form video. When your Attachment Ad appears between a Story, Snapchatters can swipe up from a CTA on the bottom of the screen. When Snapchatters open the link, they can perform an action without leaving the app. For instance, they can purchase from your website, download your app, read your article, or watch your movie trailer without being redirected to a web page. Sponsored Geofilters: Sponsored Geofilters are artistic text overlays that indicate a Snapchatter’s current location. Advertisers can buy these to promote their brick-and-mortar stores, l ocations, or events. YourSponsored Geofilter, which can be accessed through the filters menu, will only appear to Snapchatters when they’re at your location. Sponsored Lenses: Sponsored Lenses are decorative masks that alter someone’s face. With Sponsored Lenses, you can create masks that feature your business’ name or logo. For example, you can create Mickey Mouse ears lenses and add the Disneyland logo to promote Disneyland. Like Sponsored Geofilters, Sponsored Lenses are located in the filters menu. If you want to be unique and innovative like the trend-setting Snapchat, the envy of all competitors, I suggest boosting your business with the app. 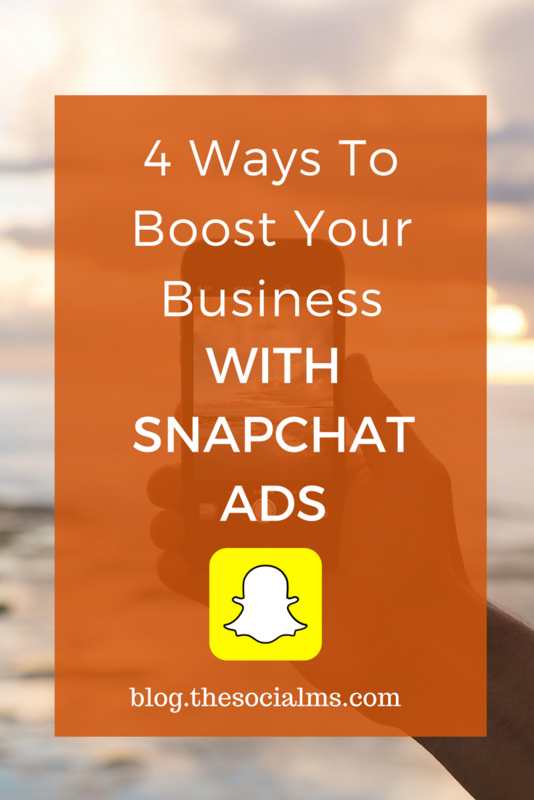 Here are the ways you can boost your business with Snapchat ads. Snapchat offers advertisers two types of Sponsored Geofilters: regular geofilters and Smart Geofilters. With regular geofilters, you can promote your business by creating creative text overlays that contain either your business’ logo or name. When a Snapchatter is at your location, the geofilter will appear, ready for use. With regular geofilters, however, you can only make one filter per store. If you have two business locations, one in Los Angeles and one in New York, you would have to create two separate filters for each. The geofilter you created for Los Angeles will only appear when a Snapchatter is in Los Angeles, and the geofilter you created for New York will only appear to people in New York. Smart Geofilters, on the other hand, are more advanced. It automatically adds location information to a nationwide or chain geofilter, including city, state, neighborhood, or zip code. With this type of geofilter, you only need to create one ad for several locations rather than one ad for each location. The Smart Geofilter’s location information changes according to a Snapchatter’s current location. One of the brands that successfully led a geofilter campaign was RetailMeNot, a company that maintains a collection of coupon websites. Here is the objective and strategy for the campaign. RetailMeNot designed a geofilter that promoted its app during Black Friday. The four different geofilters appeared across 3,000 malls in the U.S. As a result, it reached 11 million Snapchatters and garnered 20 million views. RetailMeNot also found that one in six Snapchatters used the filter. If you want to promote your chain or national stores, office, or event or if you want to target people in specific locations as RetailMeNot did, then Sponsored Geofilters would be the right Snapchat ad for you to try. If you want to advertise a movie or tv-show trailer or if you simply want to create an ad using one of your long-form videos that exceeds Snapchat’s 10-second mark, then Snapchat’s long-form video ad would be of great use to you. A type of attachment ad, long-form video ads contain a short, 10-second teaser with a “Swipe Up” CTA on the bottom. When swiped up, Snapchatters will be able to watch your long-form video, whether that’s a trailer, a how-to video, or behind-the-scenes footage. While most brands will likely use video ads that convey a strong message of promotion and sales, it would be to your advantage to create behind-the-scenes footage instead. Doing so allows you to appeal to an audience that, for years, since Snapchat is new to advertising, is accustomed to seeing no ads within the app. Creating a video ad that blends in with people’s stories, a video that is intimate and personal, would help you appeal to Snapchat’s audience. You can try showing your viewers your employees, a typical workday, or the day-to-day tasks that keep your business running. For example, this could be Starbucks showing viewers how its employees make the Unicorn Frappuccino; this could be The Museum of Ice Cream showing followers how it installs its artworks or Forever 21 showing fans how it prepares for a photo shoot. Featuring employees in a behind-the-scenes footage humanizes your brand. It shows your viewers that your brand exists because of hard-working, regular citizens—like them. Of all the conversion events, this is likely the one you covet the most. If I may paraphrase the old adage, a website is where the heart (of your business) is. A website is so important, in fact, that you can’t run a business without it. A website is where your customers purchase, contact you, find your locations, and familiarize with your brand. Snapchat’s web view ads are great formats to use if you want to send customers to your website. Another type of attachment ad, web view ads allow you to attach your website URL to the ad, which Snapchatters can access by swiping up on the CTA. Once Snapcatters do so, your website will open within Snapchat. From there, Snapchatters can browse and make a purchase from your website without leaving the app. By the time 20th Century Fox’s campaign ended, it had a 13 point increase in brand awareness, a 25% increase in watch intent, and an average of 109 seconds in play time. Here’s a glimpse of the campaign objective and strategy that led to this success. Encourage Snapchatters to play with the lenses and send their transformed selfies to their friends. You, too, can be like 20th Century Fox. You, too, can promote your launches on Snapchat. It’s a great way to familiarize 166 million people with your products before the launch, a great way to spread awareness and increase the possibility of sales. There are several benefits to advertising with lenses. Lenses appear to an audience beyond your contact list. Lenses are less invasive than attachment ads that appear between people’s Stories. Lenses are shareable: users can easily share your lens by either posting the augmented selfie on Stories or sending it to a friend. If you want to be innovative and unique, a trend setter of all brands and businesses, then boost your business with Snapchat—that’s where the future of advertising lies. Did you like the article? Please pin it!